Life in Stouffville keeps getting busier as people flock to the town seeking a better quality of life. That’s good news to the businesses that serve residents. Recently a raft of new businesses has opened up to do just that on the central west side of town. Most obvious is the Corebridge development on the site where the Longo’s now stands at Main St. and Mostar St. While Longo’s has been up and running since October of last year, the final few businesses in that development are just swinging open their doors, including two in one day this past week. 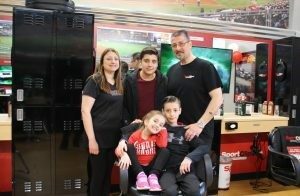 Owners Robert and Sandra Sposato, with children Daniel (middle-top), Nicholas and Sofia at the new Sport Clips in Stouffville. Sport Clips, specializing in men’s hair care and cuts, recently launched their newest franchise. The sports-themed clip joint, complete with TV sports and lockers is a unique twist on the mundane scissor experience. Owners Robert and Sandra Sposato played host to politicians and other residents looking for a clean image. Dignitaries didn’t have far between visits as next door Dr. Mehboob S. Sidhu opened up his family dental practice in the same plaza. Nearby St Louis Bar & Grill under the leadership of franchise owner Alin Illiescu is ready to feed the hungry who come by with perfect teeth and perfectly coiffed hair, and I imagine, anyone else too. 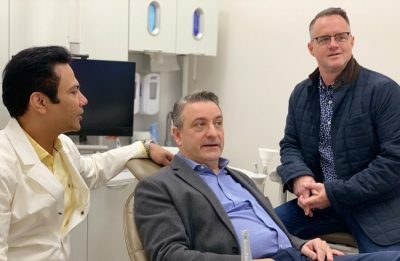 Photo:Markham-Stouffville MPP Paul Calandra, flanked by Stouffville Mayor Iain Lovatt (right) and Dr. Mehboob Sidhu at Vista Park Dentistry. ← Bikes are tuned up. Now what about the weather?